So South Korea just sent some seismic shock waves around the world the other day when it, ranked 57th in the world currently, dismantled the #1-ranked, and defending World Cup champions, Germany in the 2018 World Cup Games. Korea's celebrating, the Mexicans are celebrating, and its celebration all around, (except for my fellow Germans). When it comes to proper celebrations there's no food I associate more with than a nice, properly cooked steak. At the most fundamental level, it is just a slab of cooked meat. But depending what cut of meat it is, how it's prepared, how it's cooked and served... it has the potential to be more. And today I'm introducing a proper spot worthy of any celebration. Seoul's very own outlet of the famed steakhouse chain was the brand's 11th and first (and currently still) in Korea. When it first opened, back in 2015, it already made headlines for not only being one of the first outlets in Asia but also because of its immense size. At about twice the size of other Wolfgang's Steakhouse restaurants and in the posh (i.e.- premium real estate) neighborhood of Cheongdamdong no less, all eyes were on the Seoul branch to see if it could successfully capture the hearts (and stomachs) of Koreans. Three years later and the place seems to be doing well, attracting celebrities, couples on anniversary dinners, families for celebrations, etc. On the atmosphere factor they've made efforts to adhere to the locals. Koreans associate steak with luxury and while Wolfgang's Steakhouse is certainly upscale, premium dining it remains just below the threshold to make the cut for fine dining. The Seoul branch, however, goes for the fine dining atmosphere. There's the sweeping staircase at its entrance to the open lobby and the spacious high ceilings and layout. It makes sense since for Koreans for a long time, fine dining was defined by the five star hotel dining experiences around the city and there's a sense that the Seoul branch opted to recreate that fondness for that "private hotel dining"-feel that Koreans prefer. Then there's the details such as the enormous chandelier, walnut floors, wide-spanning cocktail bar, etc that tries to recreate that "New York" feel and sense. Beef is on the menu but a Korean barbecue restaurant, this most certainly is not. Prices are on the higher end but certainly reasonable for the dishes. Salads and soups begin at the 14K range to seafood appetizers like jumbo shrimp cocktail at 36K. That's all nice and all but everyone is here for the steak which are sold by the 100g here. 14K per 100g starts things off for the lamb chops, then NY sirloin, rib eye, porterhouse, and filet mignon for around 21K, 22, 23, and 30K respectively. The porterhouse is the brand's "representative" cut though and to make things easier based on the size of your party (2, 3, 4 people) can be ordered in the recommended 1000g, 1500g, 2000g sizes respectively. The side options are pretty extensive and to simplify things for those who have never been, they have a set option for 2 that remains one of the most popular options here: for 244K (VAT included) the 2 person set brings out their Beverly Hills Chopped Salad with a thick slab of their Canadian Bacon as an appetizer, a 850g cut of the porterhouse, creamed spinach, mashed potatoes, asparagus, brownie with ice cream, and coffee or tea. The 850g cut is smaller than the 1000g cut recommended for the 2-person porterhouse (ala carte) so depending on whether you want to focus on the beef or want to try more things on the menu, you can choose accordingly. I chose the set to see how the dishes at the Seoul branch were overall. Tables are set accordingly and servers were attentive and friendly. The spacious layout of the Seoul branch means there's enough buffer between tables to keep it a private affair (which was the intended goal of the Seoul branch as mentioned). Provided at every table are salt and pepper as well as the house sauce. Hearing and smelling the sizzle of steaks that are being carried over to other tables while you wait is torturous when you're hungry. Good thing there's warm bread to somewhat keep your hunger satiated while you wait. Definitely not skimping out by going with cheap butter either. The Beverly Hills Chopped Salad and Canadian Bacon comes together with the bacon still sizzling. The chopped vegetables is said to be seasonal but the uniform consistency of the mostly crisp and crunchy vegetables (red cabbage, cucumber, etc) combined with the tang and savoriness of the vinaigrette surprisingly complements the bacon well. The slab of bacon is thick with the pork skin still intact. Despite how it looks, its savoriness is mellow compared to regular bacon but with just the hint of salty smokiness to determine it is, most definitely, bacon. I've always wondered what would happen if the Korean favorite of samgyeobsal (pork belly barbecue) and Western favorite of bacon combined, and this is the thick-cut pork belly that would be lovely on its own for a Western-style breakfast with eggs and toast or Korean dinner with ssamjang and wrapped in lettuce. A glass of Meissel's Weiss for the meal. Went exceptionally well with the chopped salad. The highlight of the meal though is the steak and what a beaut it is in the way it appeals to all five senses. The dish its served in is piping hot with the pool of beef juice and melted butter still sputtering and sizzling. The exterior has a black, char-like crust to it which may give off the impression its been overcooked. But this special crust is intentional, created through the special broiler which cooks the steak for around a minute at 871 degrees Celsius to seal and lock in all that juice. The inside of the steak reveals a clear deep pink. Good luck trying to recreate the same at home. All steak cuts at Wolfgang's are USDA Prime Beef which, if you know, is top of the top for American beef making up just a mere 2% of the beef stock. The beef then goes through a long 28-day dry-aging process in-house to tenderize the beef without compromising flavor. And flavor we have plenty of. There's no extra seasoning, no herbs or spices that touches the meat at all and its the umami-rich beefy flavors, just slightly accentuated with the saltiness of the butter, that sings its aria. After the initial smoky, savory crust breaks in your mouth, its the tender, rich and beefy flavors that's released and no, no one will blame you if you have a split eye-rolling, "swoon" moment at the table. The house steak sauce, or any steak sauce for that matter, is completely unnecessary here and I will judge you for it if you reach for it. I sometimes get asked by my Korean friends if American and Australian beef tastes different and the answer, as the USDA Prime Angus beef here shows, is : yes, yes, and yes. Australian beef is lovely on its own and will satiate any beef cravings but when it comes to true indulgence, there is just no way grass-fed Australian beef can get that rich marbling that grain-fed American beef does. Flavor-wise it's that difference between a brined turkey or chicken and one that's not. Is the extra marbling and richness less healthy? Sure. But if you're treating yourself to a good steak, who the hell is asking about healthier options? The sides in the set are OK. The mashed potatoes is extra velvety smooth to the point you could almost consume it with a straw while grilled asparagus is hard to mess up. The creamed spinach tends to draw polarizing opinions from the local crowd and I can see why. It falls much strongly in the "spinach" camp than the "creamed" camp which I normally would prefer if not the fact that the cooked spinach gives it the taste and texture more like wilted spinach than fresh spinach. After all the savory content a sweet finisher is a welcome finisher. The brownie and ice cream is inoffensive and thankfully not too rich after your carnivorous meal. Aside from coffee, they carry a selection of premium loose-leaf teas which you can preview before selecting for a finishing pot on the table. Korea is no stranger to steak but Wolfgang's Steakhouse soars above its peers not only for the obvious deep respect and pride it has in its beef steaks but for using the cuts above other cuts. Considering that it's USDA Prime Angus beef we're talking about here, (not commonly found on your own in Korea), and due to preparation and attention its given, this is steak that's money well worth spent and I would recommend here in a heartbeat to anyone looking for a proper steak meal in Seoul. 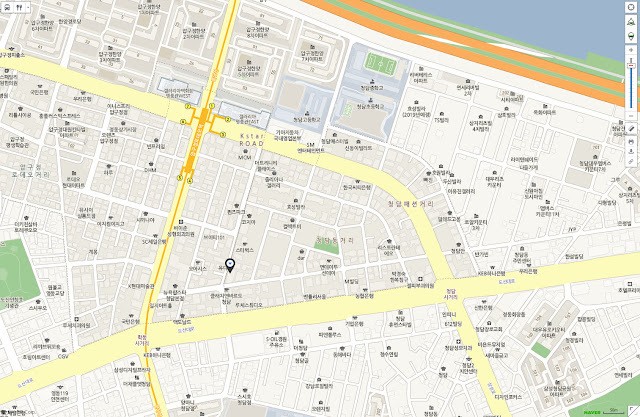 Come out of exit 4 of Apgujeong Rodeo Station and walk about 80 meters and turn left on Seolleung-ro 158-gil. Walk about 50m and turn right on Apgujeong-ro 60-gil and walk about 50 meters. You'll see Wolfgang's Steakhouse on your left. The Seoul branch regularly has special promotions going on including discounts and set menus so try checking their homepage and SNS before visiting to see if there are any deals!